I don't want to see all my photos in RealTimes or RealPlayer. Can I delete them? PC desktop (RealPlayer): Make sure you have the latest version. In the left-hand pane, simply click Videos to see just your videos. This setting will stick as long as you are signed in to your account. This option can be especially helpful if you're using our app in conjunction with Chromecast. At this time, photos (and videos) captured on your iPhone, iPad, or Android device will automatically appear in the mobile version of the RealTimes app unless they are deleted from the device. You can, however, choose whether or not they are backed up to your RealCloud storage by adjusting your Backup settings. You can choose not to include photos from your hard drive in the PC desktop application. After following the steps below, you should see only those photos that are stored in your RealCloud. 1. Click the RealPlayer logo in the upper left and select Preferences. 2. 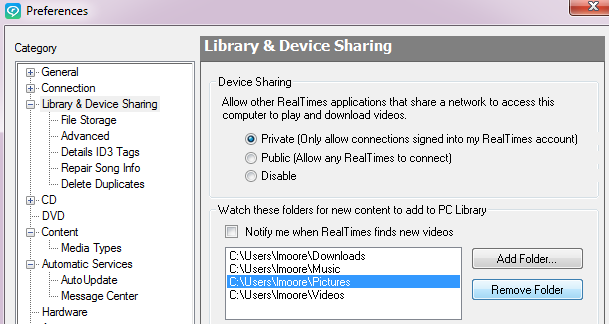 The Library & Device Sharing dialog will open, listing the folders from which RealPlayer automatically imports content. Click your Pictures folder in the list, and then click the Remove Folder button. This will prevent future photos from appearing in the app, and will also remove from the app any photos in that folder. Don't worry, no content will be deleted from your PC. 3. Confirm that you want to delete the folder from RealPlayer, then click OK.
4. 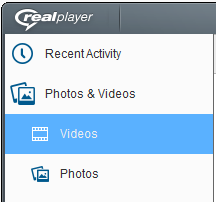 Close and re-open RealPlayer You should now see only photos that are stored in your RealCloud.